The Maison d’Hotes Victoret was started thinking of my mother Vittoria and her idea of sharing with, and welcoming, people, according to my child’s memory our house was always open to everybody. Be they friend, acquaintances or holyday markers, our guests were always welcome at lunch and dinner time for a simple wine taste or chat together in a pleasant ambiance. No booking was required at that time. All the details of Maison d’Hotes Victoret owe their origin to this memory and belong to the surrounding environment. A shelter for travellers designed to convey an idea of relaxation and solidity, a taste for a well-done job, a sense of community in the middle of the beauty of an extraordinary landscape. Maison d’Hotes Victoret offers three rooms decorated with elements reminding the making and colours of our wines – La Vigne, La Cave and Le Vin. All rooms are fitted with satellite TV, WI-FI and on en-suite with shower, hair drier, towels and a basic line of bio products. The common spaces of Maison d’Hotes Victoret are dedicated to the themes of travel and exploration where holiday makers can enjoy a room for staying together in a relaxed way. A comfortable small hall is reserved for breakfast. A corner is there available for relaxing and reading near a wood stove. Books and games are available for children. Either continental or cooked breakfasts offer the typical local delicacies — home-made jams, freshly-made fruit juices and season’s fruits. All food is produced locally — bread, milk, butter, fontina (local cheese), spreadable cheese, cured meat and special bacon-fat (lardo). On request food for celiac people can be served. 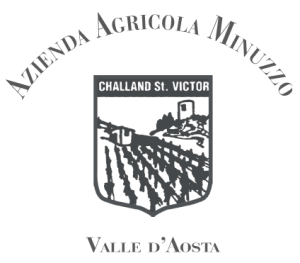 The area of Challand Saint Victor is particularly suitable for vineyards and here the Minuzzo family has produced quality wines for two generations. Lovers of fine drinking can share our experience visiting the family vineyards and cellars and tasting our wines. Prices are per room per night, breakfast and tasting included / Car bay. You find the Maison d’Hotes Victoret in the small village of Sizan (township of Challand Saint Victor) at the beginning of the Val D’Ayas (altitude 700 mts — 2100 ft). It is situated in an ideal position for walks and trips in the middle of a natural landscape, to visit places of a great historical and art heritage suitable for mountain lovers. It takes only 5 km to reach Challand Saint Victor from the Verres junction of the Aoste motorway.